4.5.10 The government must present a statement of cash flows for proprietary funds. The only acceptable method of presentation is the direct method. In using the direct method, a reconciliation of operating cash flows to operating income is required. 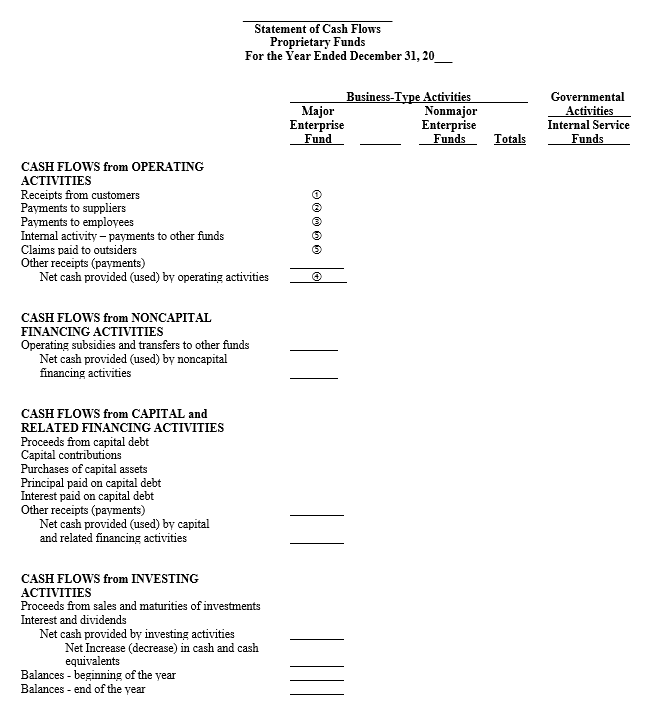 4.5.20 GAAP requires cash flow activity from blended component units to be presented on the statement of cash flows; however, the statement should not contain cash flow activity from discretely presented component units. Directly benefit individual constituents of government. 4.5.70 Program loans typically refer to loans that meet both of these exceptions. 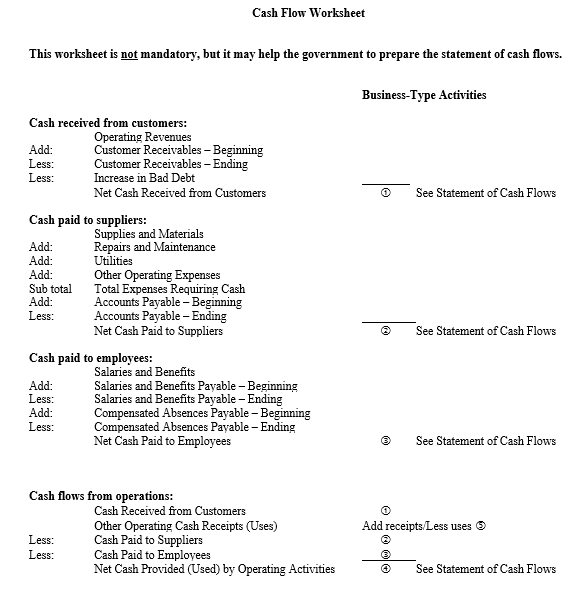 The collection of principal payments related to program loans is reported as a cash inflow in this section. Borrowing and repayments (principal and interest) of debt that is not clearly attributable to capital purposes. Capital purposes include capital acquisition, construction, or improvement, including capital lease repayments. Borrowings to finance program loans. Grant proceeds not specifically restricted to capital purposes. Grant payments (both capital and otherwise) to other governments. Transfers to and from other funds (except when a transfer is received for capital purposes). Tax receipts not attributable to capital purposes. Interest paid on noncapital-related vendor payables. Borrowing and repayment (principal and interest) of debt clearly attributable to capital purposes. Proceeds of capital grants and contributions. Transfers from other funds for capital purposes. Payments related to the acquisition, construction, or improvement of capital assets. Sale or involuntary conversion of capital assets (such as insurance proceeds resulting from the loss of a capital asset). Tap fees in excess of the actual cost of connection (if they are to be used for capital purposes). Taxes levied specifically for capital purposes or related debt service. Receipt of interest (except on certain program loans). Loan collections (except for certain program loans). Proceeds from the sale of investments. Receipt of interest on customer deposits. Changes in the fair value of investments subject to fair value reporting and classified as cash equivalents. Loans made to others (except for program loans). 4.5.120 Governments are required to provide a reconciliation of the difference between cash flows from operating activities and operating income. This reconciliation should be presented either within the statement of cash flows or as an accompanying schedule to the statement. The transaction would not properly have been classified as cash flows from operating activities. This information can be presented either in a narrative or tabular format on a separate schedule accompanying the statement of cash flows.